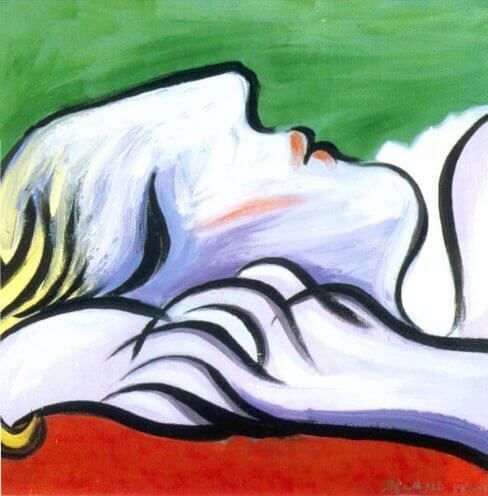 The model of this painting, Asleeep, painted in 1932, is Picasso's mistress Marie Therese. She was resting between the two powerful polarized color blocks of red and green, which accentuate the tranquility of Marie Therese while sleeping. The solid black outline around the Marie's hands and profile is a feature of the series recalling the Fauvist's black binding of color blocks. Pay attention to Marie's hands. Her claw-like features give her an "animalistic primitivism," which is a belief in the simpleness and unsophistication of life. It is a weird combination of beauty and ugliness, another theme that continually fascinated Picasso and was depicted in many of his other paintings. The Surrealists' fantasy world is hinted, yet the viewer is seeing outer materiality instead of the model's subconscious mental processes. The work is more an impression of the artist's sub-consciousness and with the sensual look, the depiction can be turned into a sexual organ.